After securing a costly victory at the Battle of Spotsylvania Court House, Union General Ulysses S. Grant encountered Confederate troops as he made his way to Richmond. The Confederates, under command of General Robert E. Lee, were entrenched behind earthworks at Cold Harbor, a crossroads ten miles northeast of the Confederate capital. Over the course of the next nine days, the Union lost 7,000 men while the Confederates suffered 1,500 casualties. 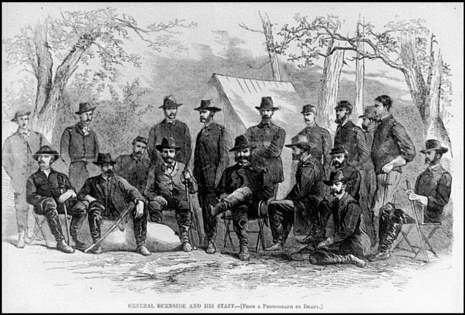 Grant moved on toward Petersburg and began the last major siege of the war. Confederate forces finally abandoned Petersburg and Richmond on April 2, 1865. The first battle of Cold Harbor, also called the battle of Gaines' Mill, took place on June 27, 1862. It was part of the Seven Days' Battles (June 25-July 1) that ended General George McClellan's Peninsular Campaign -- an early attempt to capture the Confederate capital. 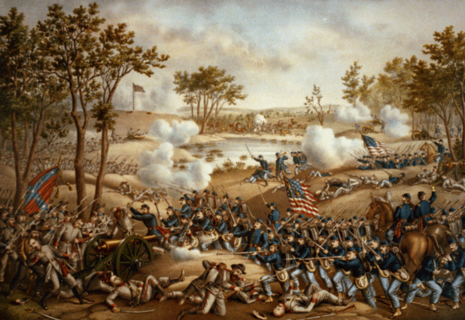 The Battle of Cold Harbor, the final battle of Union Lt. Gen. Ulysses S. Grant's 1864 Overland Campaign during the American Civil War, is remembered as one of American history's bloodiest, most lopsided battles. Thousands of Union soldiers were slaughtered in a hopeless frontal assault against the fortified troops of Confederate Gen. Robert E. Lee.